The line is formed on Page 11 of Serpents in the Water. The Morantine pour broadside after broadside into the leviathan. You can see the leviathan’s response when you vote for Snow by Night on Top Web comics. The line was a devastating formation for galleons and frigates of this era. It covers the weakness of the sailing ship — the fore and the aft, where they have few canons. By forming a line, the ships support each other and concentrate their fire on a single point. The effect was devastating. I’m at Balticon this weekend! Hanging out with George R.R. Martin who is the Guest of Honor. And by hanging out, I mean I will be in the same hotel. General vicinity counts, right? I won’t be posting a new page on Monday as it is Memorial Day. The next page update will be Wednesday June 1. That might hurt. Worst supper ever? I love the fact that you pay attention to details like this to work into your stories. It’s exciting to be able to learn new things about history from my webcomics. Awww thanks! 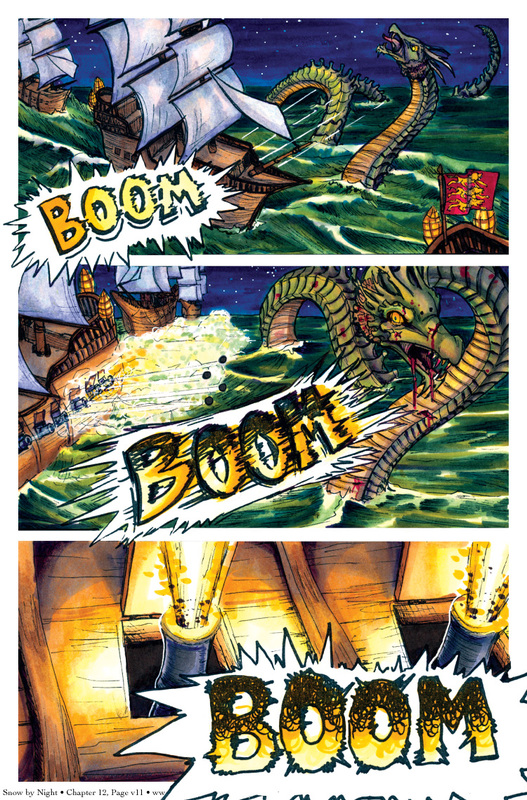 The image of a sea serpent fighting a galleon is what led to this vignette. I completely agree with Celidah! So that’s That one. Now where Is the mother at? Fried fish tonight! Don’t forget the tartar sauce.